I receive A LOT of emails and comments about buttercream. I try to respond to them as thoroughly and promptly as I can, but sometimes I just don’t have the time to do so, and that makes me feel bad. 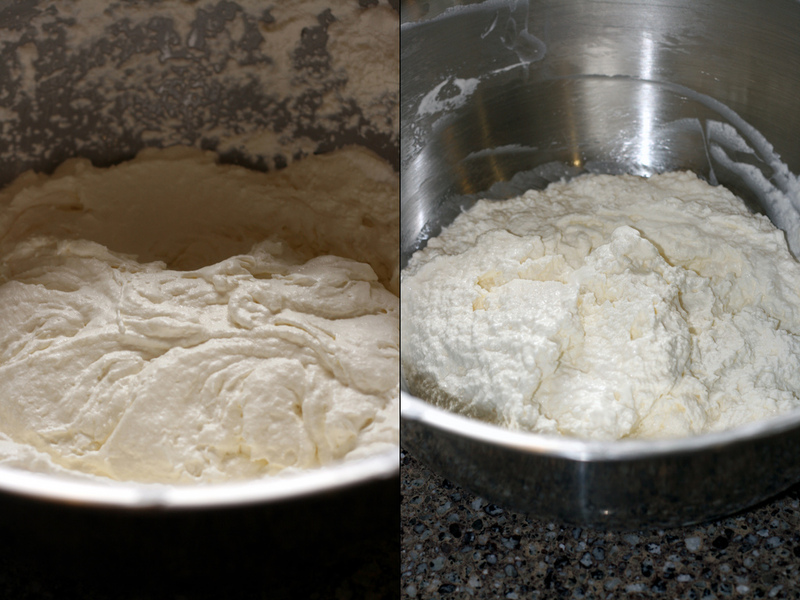 So, what I decided to do was start a bit of a “how to” series on making different kinds of buttercream. I want to be able to address any questions that you guys may have, and be able to offer guidance with step-by-step photos just so you’ll feel a little bit more confident about trying out the recipes. I know that stepping away from the classic powdered sugar and butter frosting might seem a little scary, but it’s really not that difficult. European buttercreams may take a little longer to whip up and may make a little bit more of a mess, but trust me – it’s worth it. Swiss and Italian Meringue buttercream are less cloyingly sweet than traditional buttercream and, in my opinion, both have a more pleasant mouth feel. Also, when you present a cake to someone and tell them that it’s frosted and filled with Swiss or Italian Meringue Buttercream, it makes you sound really fancy, and that’s always good, right? Especially since they never have to know that it’s not that hard to make! So, let’s jump in, shall we? Swiss Meringue buttercream was the first European-style buttercream I ever made. It’s a little easier than Italian Meringue buttercream and it uses nearly the same exact proportions of ingredients. The taste is identical, but the difference is evident in the texture; Swiss Meringue Buttercream is a little less light than its Italian cousin, and feels a little heavier (but not oily!) on the tongue. Because it is thicker, I chose to use it for the Super Epic Rainbow Cake for structural stability. You must be sure that you are using LARGE eggs or the proportions will be off. 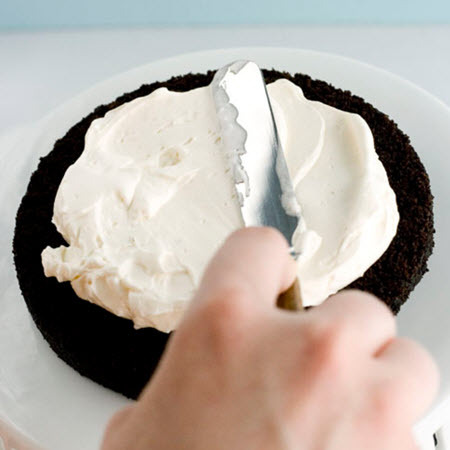 Your frosting will not set correctly if you use larger or smaller eggs (unless you compensate for the difference, but most people, myself included, are too lazy to bother). The egg whites do not have to be room temperature for this recipe, but it will speed things up if they are. This is granulated sugar. Do not use powdered sugar! This is more hardware than ingredient, so… My bad. This water will be poured into the pan of your double boiler. Alright, now that you have your ingredients ready, let’s move onto hardware. A small pan and an accompanying bowl (not pictured – oops!). If you have a double boiler, use it! I don’t, so I suffice by doing it this way. Be sure that the bowl fits well on top of the pan and doesn’t set too low in it. You can use a hand-held model or a standing model. 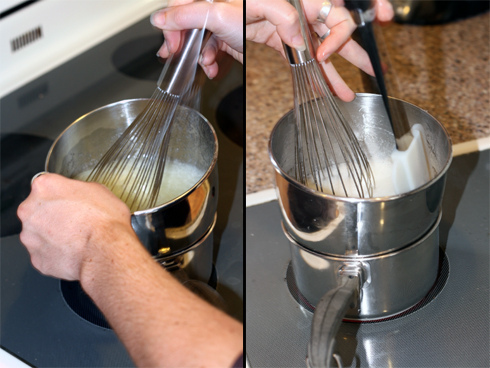 Or just a whisk if you’re crazy like P.
Begin by pouring an inch or two of water into the pan of your double boiler. 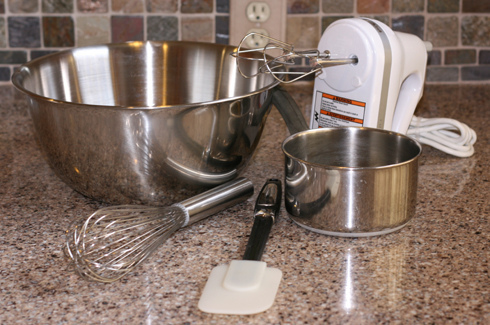 If you are simply using a pan and a bowl, make sure that the bottom of your bowl does not touch the water. If this happens, your eggs will scramble and you will have to start again! After an appropriate amount of water has been added, bring it to a simmer. 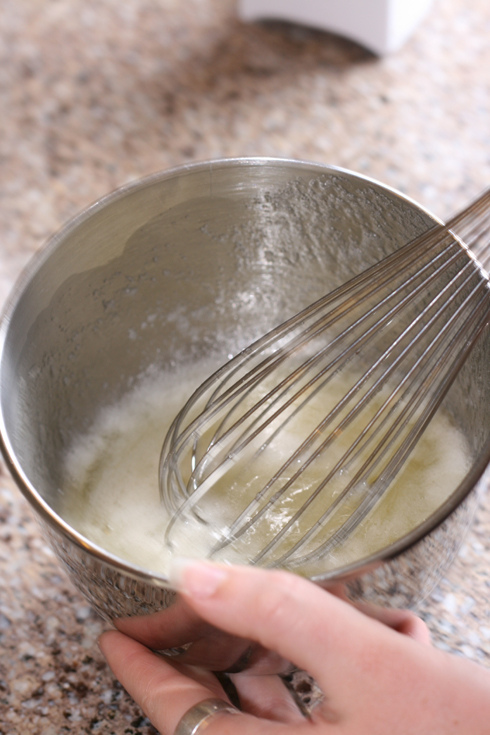 Meanwhile, combine the sugar and egg whites in the bowl of the double boiler with a whisk. You are not trying to whip the whites at this point, so don’t worry about creating volume. Just be sure that they are evenly combined. When the water is simmering, place the bowl over the pan. Whisking constantly, heat until the sugar is completely dissolved and the mixture is quite hot to the touch (160F on a candy thermometer), about five minutes. Be sure to scrape down the sides of the bowl every once and awhile with the rubber spatula to get all of the sugar off the sides of the pan. 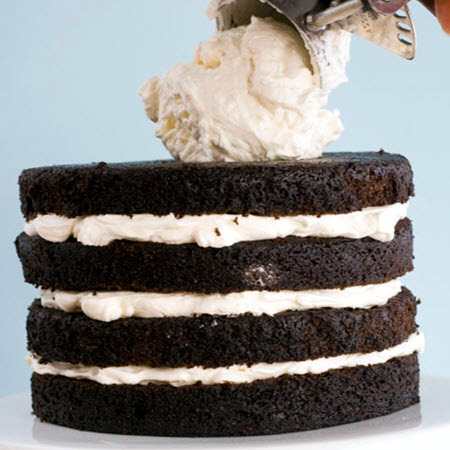 If all of the sugar doesn’t dissolve, your frosting will taste fine, but it will be grainy and won’t look smooth. Heating the eggs and sugar has a few purposes. The first of which is that it melts the sugar, resulting in a very smooth meringue. And have you ever heard that room-temperature egg white whip better than cold ones? That’s because room-temp egg whites have a more relaxed protein structure in comparison to cold ones, and heating them further only loosens that structure more. This means that heating the eggs allows them to whip to a higher volume. Also, cooking the egg whites can serve as a method of pasteurization if you have concerns about salmonella. 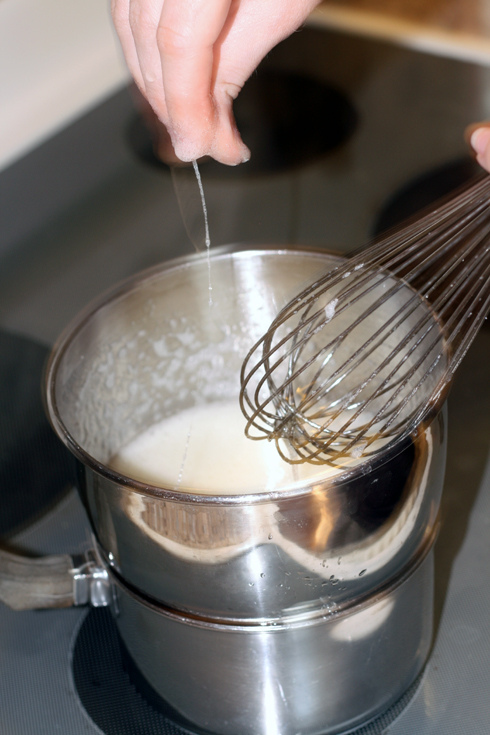 Just use a candy thermometer to ensure that the egg whites reach 160F before continuing, and then continue as directed. Anyway, the whole process should take about five minutes. 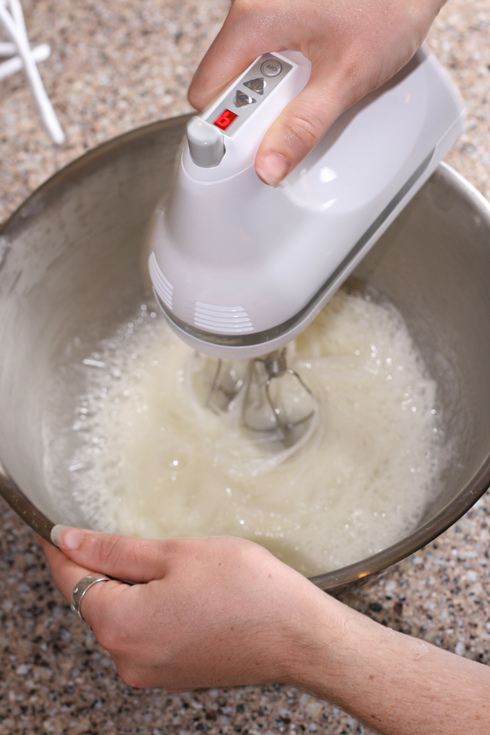 To test if the sugar is dissolved, just dip your fingers into the mix (don’t worry – it’s not going to hurt you!) and rub some between your fingertips. If it’s gritty, keep cooking! If not, move on (after washing your hands, of course). 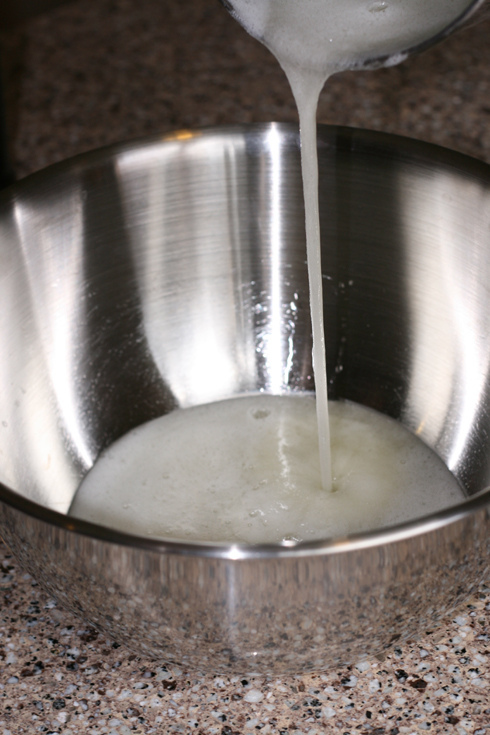 Pour the mix into a larger bowl (you may use the one from the double boiler, if you like, or a stand mixer if you have one), scraping the pan with the rubber spatula to get as much out as possible. 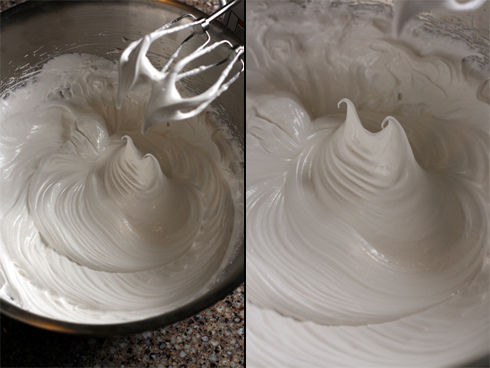 And eventually you will have a lovely, glossy, light and wonderful meringue! It’s a lot like marshmallow, at this point, and quite stiff. 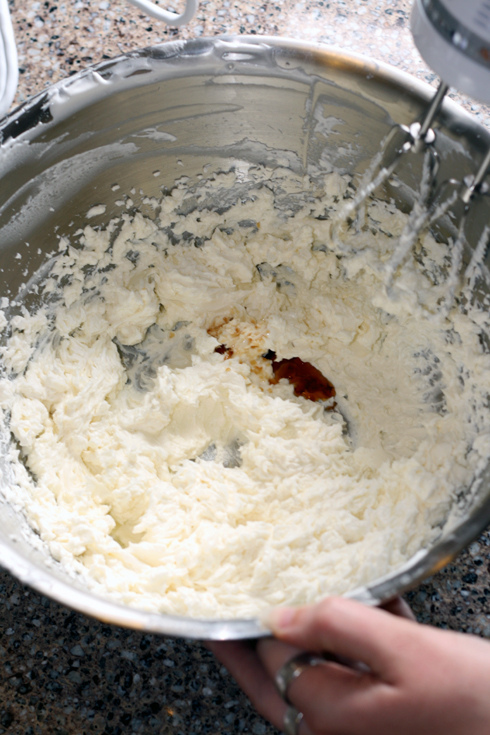 The bottom of the bowl should be room temperature and the egg whites themselves should have cooled. The whipping will take ten to fifteen minutes. 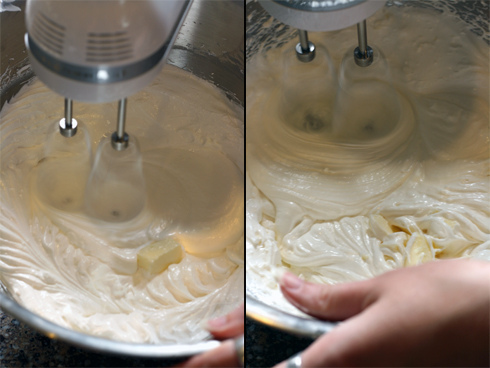 With the mixer on high speed, add the sliced butter, piece by piece, to the meringue. 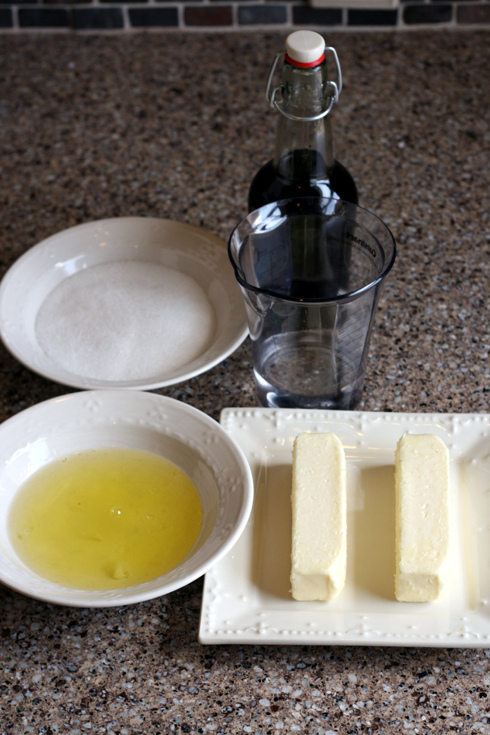 Be sure to add the butter SLOWLY and make sure that each pat is completely incorporated before adding the next (counting to 15 usually works for me). Don’t panic when the meringue deflates. That’s supposed to happen, and it’s totally fine! Sometimes the buttercream becomes soupy after all of the butter is incorporated, and I have not been able to discern if that is due to adding the butter too quickly (which we did intentionally here) or if it is due to the butter being too warm. However, the cause is not terribly important, because I will show you how to fix it! Put it in the fridge. Seriously. Just let it cool for 5-10 minutes before you whip it again. You might also try adding a few more tablespoons of butter. 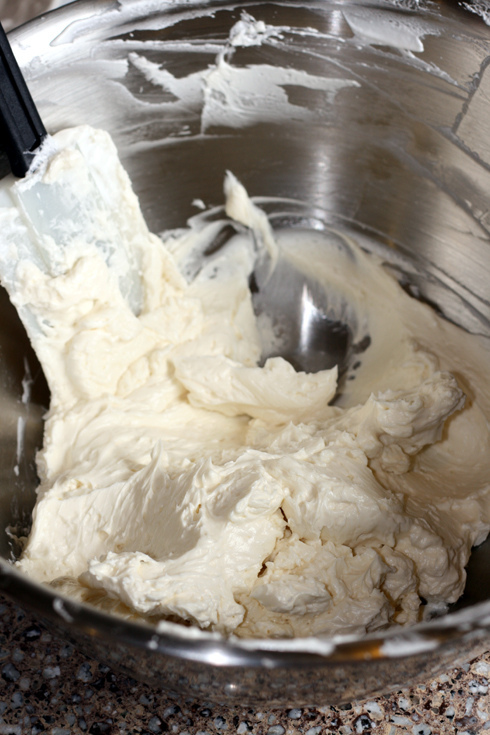 Of course, if your buttercream is not soupy, just keep whipping it. … And keep whipping! I promise that it will smooth out. And when it does, it is time to add the flavoring of your choice. We chose 1 teaspoon of vanilla for today, just to keep things basic. And wound up with a little over 2 cups of wonderful, luscious, smooth Swiss Meringue Buttercream! Now, to address the topic of flavorings. 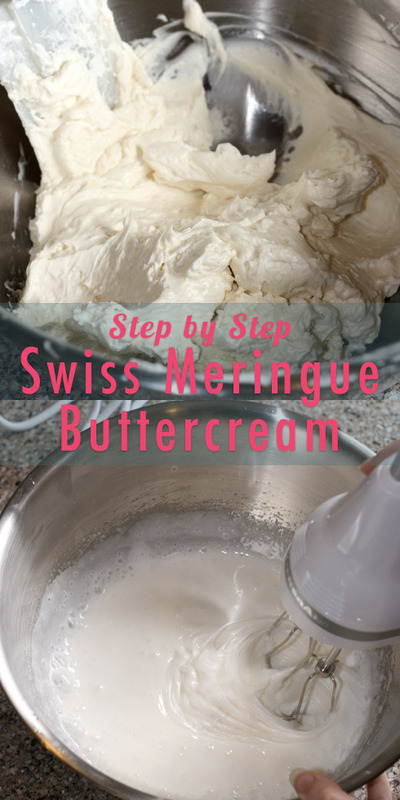 I think I have exhausted my knowledge of this subject for the time being, so I would love to open this post up to anyone who has any questions about Swiss Meringue Buttercream. If you’ve want to ask something, please feel free to do so in a comment, or e-mail me if you prefer! I’ll try to work the answers to your questions into the post if I’m able, or maybe I’ll just add a small FAQ. At any rate, thanks for reading! I hope I’ve been able to make at least someone feel a little better about this whole process. Keep an eye out for the next “how to” which will focus on Italian Meringue! Oh, and before I go – I would like to thank P’s family (Happy birthday to P’s mom!) for allowing P and me the opportunity to use their kitchen for this project, and I would also like to thank P for all of his help! I love that you&#39;re taking the time to give us a Buttercream education! Thank you so much, this is great!! this is so great!! 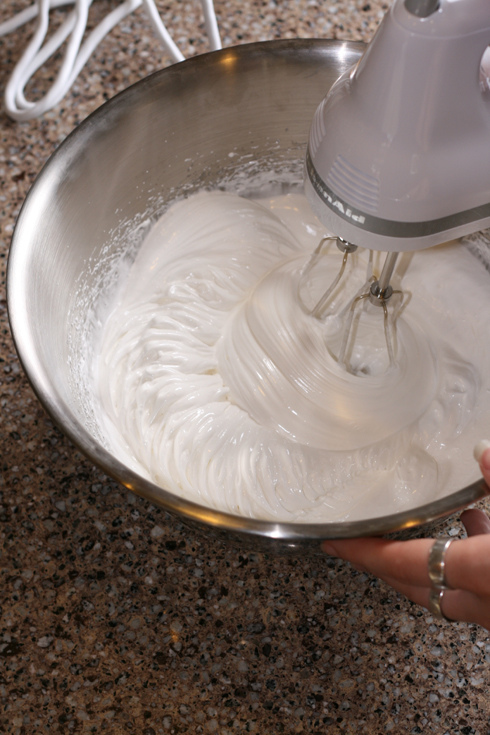 i tried to make swiss meringue buttercream once and only once because it was a huge disaster! i&#39;ll have to give it another shot. Thanks for this great step by step (with pictures) tutorial! I was never quite sure if I was making buttercream right so I just make EVERYTHING with cream cheese frosting. Now I can branch out! Thank you for putting together this post! 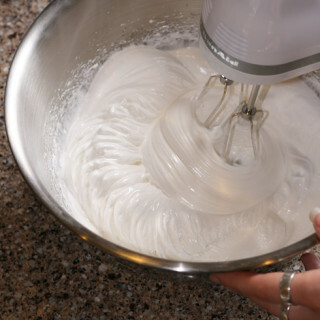 I&#39;ve had some trouble in the past with Swiss Meringue Buttercream (and I think you noticed it when I made my cupcakes on my blog)but I&#39;ll be sure to use your tips next time I attempt it! This is an awesome tutorial! Can you colour this frosting? This is amazing, I have been searching for something like this for ages! step-by-step photo guides make me feel safe, like the recipe I am going to be trying out is worthwhile!<br /><br />Thank youuuu!!!! This was great! I&#39;m a total beginner and have followed your blog for a while now (I&#39;ve got some Boy Bait in my fridge now!) <br />I&#39;m exited to try this one, maybe I&#39;ll tackle the rainbow cake too while I&#39;m at it. <br />I think you should post your final cake too if you have photos!! Always good to see what you do with the end result! <br />Keep baking! OK.. 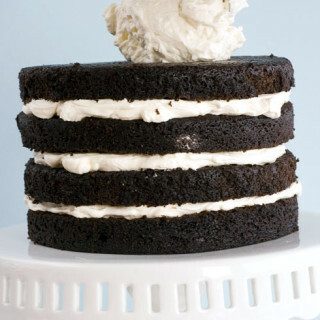 I have the local village show on saturday and there are 2 recipes calling for buttercream icing, so I AM making this tomorrow…. I will report back… and if I win I will send you a rosette! 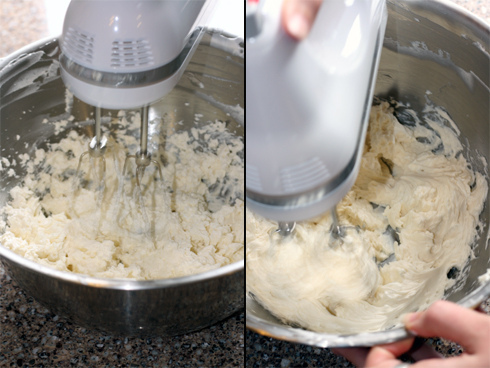 This is so helpful – especially the photos of the stages – it makes it easy to know if your buttercream is going in the right direction – many thanks! THANK YOU THANK YOU THANK YOU! !<br />This saved my life, thank you so much for taking the time to do this. I&#39;m eager to try buttercream again (: Your photos and tips are so helpful! I am eating this fronting with a spoon out of a bowl right now. Mmm, so good! I usually stick to the traditional butter and powdered sugar frosting, but have been dying to try this. I just have this hangup about wasting all those egg yolks. 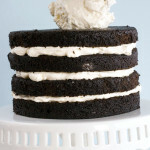 Soooo could I make this frosting using Meringue Powder to make up the egg whites? Or do you have any good suggestions for the use of all those egg yolks? <br /><br />BTW I love reading your blog! Keep these tutorials coming!! I made swiss and italian meringue buttercreams quite a bit. I find that the swiss become soupy more easily for whatever reason. Another fix I&#39;ve found (in addition to refrigeration) is just add more butter. A lot of times another half stick or so of room temperature butter will make it firm right up. This sounds so complicated but so yummy! And so well explained!<br /><br />Do you think you could give a weight measurement of the 5 egg whites because what we call large in NZ might be different to what you call large in America. Agree! I need this in Aus too! Thank you for your tips!!! I made Italian Meringue buttercream for the first time today, and the meringue looked amazing until I added my butter – then it turned to soup! I put it in the fridge as u advised, and it made the IMC curdle. I took it out after half hr and beat it again and it managed to whip back into a silky fluffy buttercream! Hallelujahhhh! TQ!! Have to try it… I live in switzerland, we have this with &quot;Doppelrahm&quot; (no good for the diet)… and strawberries. I lately got a revelation when my better half decided to celebrate sth in a restaurant: I can&#39;t have industrial swiss meringue anymore. funny that this lovely recipe comes from very far away!!! Hey, i&#39;ve never made buttercream before and today i said i&#39;ll give it a try. Your tips and step-by-step were great. The buttercream turned out perfect. I also mixed some blueberries in it. Keep on the good work! Hi,<br /><br />I made this buttercream recipe for the first time yesterday, and it turned out to be absolutely PERFECT. Every time I got scared that the buttercream was looking too liquidy or that it was like a mess of clotted cream, I just reread your instruction with the pictures for encouragement. Thank you for such a helpful post! Kate…..my attempt was a complete disaster….it got all curdled 🙁 i tried doing what you suggested and it didnt work….any suggestions?? Glad you guys like the tut!<br /><br /><b>Adriana</b>, how long have you been whipping it? 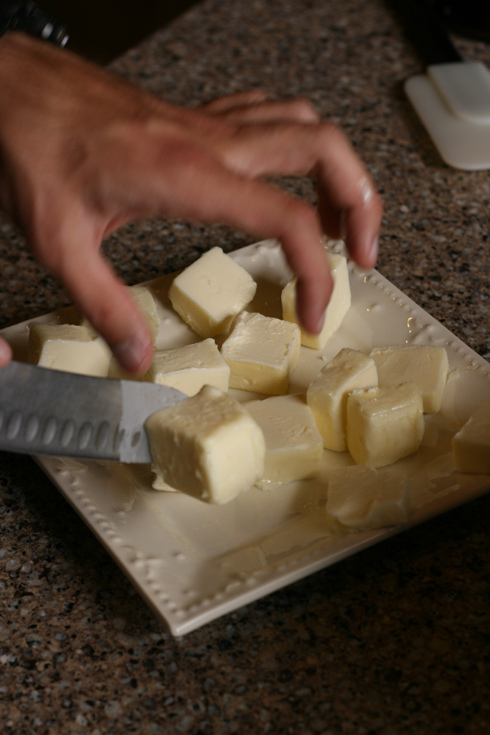 If it won&#39;t come together after 5-10 minutes, try adding more room temp butter. I suggest 4 Tbls to start, then more if it still doesn&#39;t come together. Good luck! THis recipe is perfect. I made it twice in the last week and it turned out perfect. The step-by-step pictures, and the troubleshooting suggestions, are perfect. A valuable resource on the internet! I&#39;m so glad that you liked it! Devorah, thanks for mentioning it, but you really don&#39;t need the double boiler. It just helps distribute the heat more evenly which I thought might be a boon to those making this frosting for the first time. I don&#39;t use one, myself 🙂 <br /><br />I&#39;m glad that it worked for you! Thank you so much for this incredible &quot;how to&quot;. With your help i&#39;ve made the most amazing swiss meringue buttercream ever!!! I´m going to use it for a ruffle vainilla cake to celebrate the Royal Wedding of William and Kate! <br />Keep on baking and being so great!! 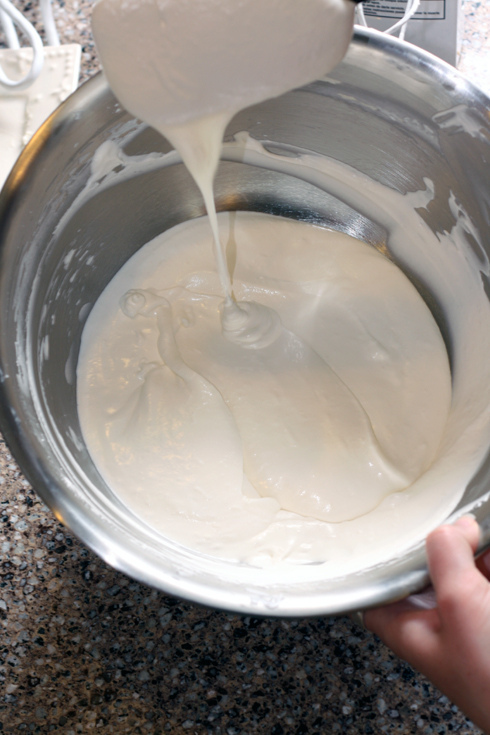 hi!<br />I love how informative your tutorial is.<br />And I tried it but my egg white wouldn&#39;t whisk up.<br />It stayed liquid after trying to make it into a meringue. do you have any suggestions? Veronica, I am happy to hear that you liked it so much! <br /><br />All.is.on, it sounds to me like you might have had a bit of yolk in your whites. If there is any yolk (or fat of any kind) in the bowl at all, the whites won&#39;t whip. Maybe try again with a super-clean glass or metal bowl? Omg I&#39;m so glad a ran into this blog one word amazing! Thank you for putting up all your knowledge. 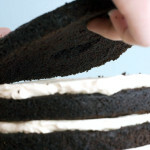 Wow – great blog, beautiful cakes. Tried making Swiss buttercream today for the first time following your recipe and instructions and it was fantastic! Thanks! Thanks so much guys! Lisa, I am glad that it worked out for you!<br /><br />Anonymous, unfortunately I don&#39;t think there is a substitute for the butter. Maybe try frosting with whipped cream instead? This was such a wonderful help! I flavoured mine with chocolate. It turned out perfectly smooth and tastes delicious, like a chocolate milkshake! The pictures were super helpful! Thanks! Hi, could you use lemon juice instead of extract? Glad you liked it, Alk86!<br /><br />Anonymous, lemon juice might work but you&#39;d have to add more juice than extract which could make the frosting watery. I have 150 cupcakes to make for a wedding. Would this work if I made it the day before and put it on cakes on day of wedding (only asking because I have to travel 450 miles with cakes). Tracey, I think you will find that this isn&#39;t terribly sweet. I am not familiar with Milo powder, but melted and cooled chocolate works well. <br /><br />Anonymous, you can make this in advance without any trouble. You can even store it in a piping bag out of the fridge overnight if you wish. I made this, to go with your Rainbow Cake, it turned out perfectly. Your instructions are great. Thank you very much. Wawa said… I made this icing today. I first should tell you that I don&#39;t bake and this is the first icing recipe I have ever tried. It actually worked out for me. I am surprised with myself. I followed your step-by-step instructions, thank goodness for the pictures as this helped a lot. Now I can&#39;t wait to try this out on my simple cake. Woohoo! So glad to hear it, guys! Sally, I am sorry you had trouble. Hope this guide will help you.<br /><br />Anonymous, I would suggest adding a few spoonfuls of lemon curd or some lemon extract! It worked!<br />My attempt at the italian one failed drastically this morning, but this one turned out great. I too had this problem – there were tiny chunks of butter that wouldn&#39;t beat out so I put it back over the pot of simmering water and beat it and it smoothed out. I then put it in the fridge for 10 mins and then beat it again and it turned out perfectly! I was unable to rescue it. I did thicken it up a little, so I added some crushed hazelnuts and used it as filling. Gaidig, I&#39;m sorry I didn&#39;t get your comment in time. I hope the filling was tasty, at least! i am making the SM buttercream and it is acting more like soup! What did i do wrong??!! My daughters Bday party is tomorrow…Help! Hey, I&#39;m not sure what&#39;s wrong – was the bowl clean? Did you cook the egg whites until they were hot? If you see this comment, my best suggestion is to add a little more butter until it comes together. Hi Kaitlin, <br /><br />Thanks for the tutes! It looks complicated and all,but apart from having to whisk the egg whites like mad on the double boiler, everything else is surprisingly …. less hard than I thought. Keep up the good work! Thank you for such a clear step-by-step. I am going to attempt the rainbow cake with meringue icing for my son&#39;s 1st birthday cake next month. Could you use white chocolate powder instead of melted chocolate? And if flavouring with chocolate, do you add it where you would normall add the extract? And one last question, roughly how much? Thanks! Glad you appreciate the instruction 🙂 I actually don&#39;t know what white chocoalte powder is.. Is it like cocoa powder? I usually just melt some chocolate, let it cool, and add it in. Maybe 1/2 c for this recipe. Yummy! It looks so pretty and glossy without the butter, what if I skip that step? Can I fill the cake with this deliciousness and cover it with fondant? Will it keep for 2 days on the counter on a cool day?<br /><br />I will try Italian MB next. The sugar syrup part scares me. I even got the candy thermometer, now just need some courage. Excellent, excellent recipe! I followed your recipe exactly and it came out beautifully 🙂 I used my icing for French macarons, and I made half the icing vanilla and the other half butter-rum. Thanks for putting this up. hi there|! thanks so much for this step by step instruction of how to make smbc. 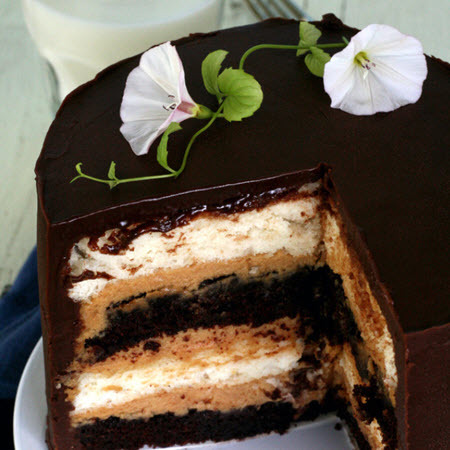 im planning to use it under my fondant (as a crumb coat and filling) for a bithday cake, is that possible? if so, where to keep the whole frosted cake? how long with the frosted cake lasts? thanks so much! 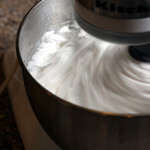 Sibel, I would use <a href="https://whisk-kid.com/2010/08/how-to-make-italian-meringue.html&quot; rel="nofollow">Italian Meringue</a> for that instead. I think it might be more stable! And I wouldn&#39;t use a frosting without butter for fondant cakes as I don&#39;t think they&#39;d hold their shape. Swiss Meringue is great for it though, and I have left cakes out for two days with no trouble. Wow, thank you! I am soooo happy to find something other than the appalling crisco-butter-powdered sugar recipes on so many other cake decorating sites and classes. Now I&#39;m off to read your tutorial on Italian Meringue. hi there,<br /><br />would it be okay to use melted white chocolate in this recipe? <br /><br />Thanks! It certainly would 🙂 Just make sure it&#39;s cooled and add it at the end. Thank you so much for your post on buttercream. I do have one question though, my sister has made this buttercream twice and each time it has turned back to the yellow colour of butter….is this normal? and how can we get it back to the lovley white colour? Thanks again! 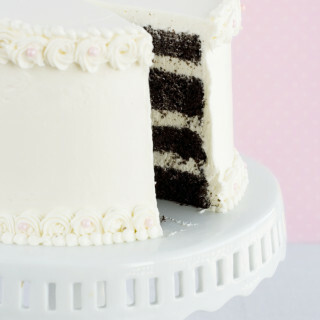 The buttercream is a little more ivory than white, but never yellow. I am not sure what that would happen. Maybe the vanilla? Which photos would be most helpful? Made this icing today along with the rainbow cake. It all turned out great other than the taste of the icing! It tasted too waxy and too buttery. Any suggestions? Hi Pam,<br /><br />Did you use a cheap butter? Sometimes if I use a store-brand the taste/texture of the frosting suffers. Yup, sure did! Ok, so name brand it is next time around! Thanks Kaitlin. I use store brand, usually. It might be that you aren&#39;t cooking the egg whites hot enough, or maybe that you&#39;re adding the butter too fast? Is the butter melty or just soft? You want it slightly firm, but warm enough to be smooshed if you press it with your finger. Mine has done the same thing. I’m trying trying trying to whip the lumps out but it won’t work. Cooked whites til warm/room temp as the guide says and sugar dissolved. Have refrigerated and re whipped a few times now. So annoyed I’ve lost 9 egg whites! I made the 5 egg white batch with no problems. AH!!! That is such great info! Thank you! I am very happy to know that. thank you i live in northern ireland and from online heard of trex as it doesnt effect your food colouring due to not using yellow butter. nice to find someones tried this with trex and it tastes good. although bit worried about your deco statement i want to use it to pipe deco for wilton 3d penguin cake tonight. Kaitlin, This is a terrific tutorial. Thanks for sharing all of your &quot;fix&quot; secrets! I found your site because you were mentioned as the inspiration for a blog post on <a href="http://cakestacks.blogspot.com/2012/03/lemon-sunshine-cake.html&quot; rel="nofollow">Sugar Rush</a>, and the pictures look luscious there, too! Amazing….I am a convert! No more sugary icing for me…wow! I love it! Thanks! I had a lot of problems after adding butter. it went so soupy and wouldnt thicken, so i added some royal icing sugar and it curdled, and than i thought &#39;thats it! I give up!&#39; but after a bit more whipping bang! It was buttercreme! tastes fantastic too!! Thank you very much – made my first ever batch of this using your tutorial and it worked perfectly!! Will be bookmarking this page for sure!! Finally i found this! i was about to give up on buttercream coz i was doing it like wrong for 3 times already..thanks a lot! Thank you so much for this recipe! About to attempt it tonight and just wondering if this will be enough to do a thin crumb coating and then full coating over a rainbow cake?! Oh no… the pictures didn&#39;t load so I was not sure what it should look like before I added the butter… and I did it TOO SOON!!!! Is there any way to salvage my cream? Its flat and looks like it will NOT stiffen or peak. 🙁 <br /><br />Ahh! I need Buttercream 911!!!! I just tried making this icing &amp; it tastes really, really buttery. Where did I go wrong? Any help appreciated as its for my 4year olds birthday in 2 days – thankfully I did a trial run first. This recipe is fantastic &amp; buttercream is fluffy &amp; light and tastes amazing!<br />Thanks for the easy step by step instructions. I&#39;ll also confess that I HATE icing….BUT I COULDN&#39;T STOP SAMPLING THIS STUFF!! SOOOO GOOD! Made this today for my daughter&#39;s first birthday cake-OH. MY. GOD! It is sooo good! And, I am pretty sure 90% because of this tutorial, it really wasn&#39;t hard at al! Anyone reading this who is scared because of the mention of the words &#39;double boiler&#39; don&#39;t be, that is a very easy, minor part of the process. I love your blog and am excited to make the rainbow cake and try the swiss buttercream for the first time, I&#39;ve always made the old boring wilton buttercream. 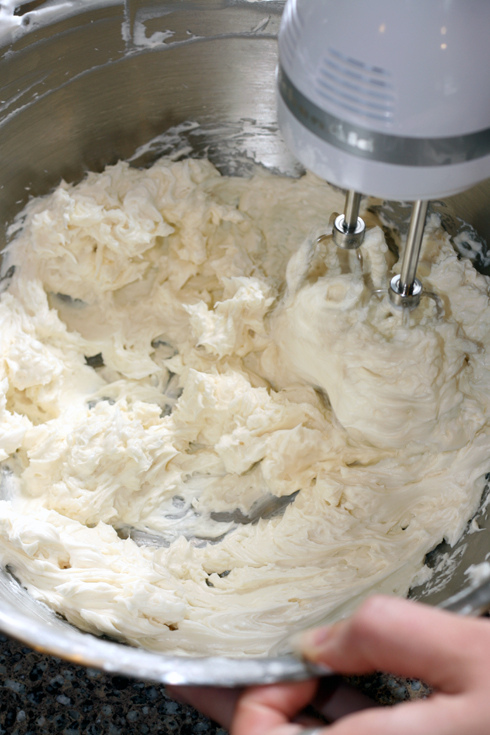 Some advice – what type of buttercream is best for a humid environment? I live in Bermuda, where it is humid ALL the time, and my buttercreams often wilt. Would swiss or italian hold up better? Thx! It sounds like your butter is too cold, maybe? Allow it to soften first. Thank you for the great tips to overcome the disasters in between. I made a batch for my niece&#39;s christening and it got all curdled up. I was all depressed and thought its not my recipe to try. But I went through your tips and WOW!!! it came out perfectly and my aunt says it tasted like icecream, also holding the shape neatly.. Thank you once again. Can you stop when you reached stiff peaks? I mean put everything away until its all at room temp? Or maybe put the merangue in the fridge before I put the butter. I think my mixer&#39;s whisk also heats up after beating the merangue. I use hand mixer too. 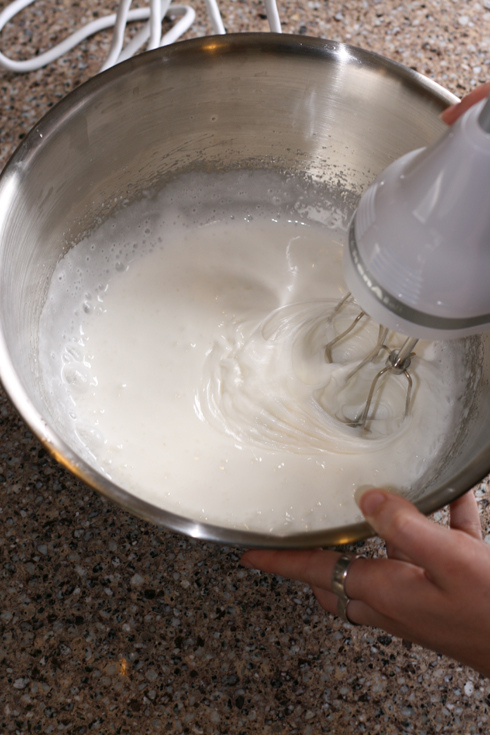 Hi,<br />CAn you replace the egg whites with meringue powder? i would never have dared to do this without your tutorial, thank you so much for sharing this and for going into every detail including what can go wrong. It may be beginners luck that nothing went wrong for me this time but I think it was all down to you and your wonderful explanation for every step of the way. By the way it is beautiful. I love, Love, LOVE the “How-To” Series! What an inspired idea, and a very generous thing to do to all of us who can use all the help we can get!! I’m so thrilled to hear that the series is helping you out! Have you made a batch of frosting?! How did it go? I’m going to give this a try cause I always seem to have extra egg whites and can only make SO many meringues. I can’t make macarons (NOT macaroons) for the life of me. I look forward to trying this recipe. I have only ever made regular buttercream I was wondering if it is possible to pipe with SMBC, specifically roses? Hello Auncott! I don’t really like to pipe with SMBC. 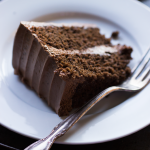 It isn’t as smooth as regular buttercream and occasionally “breaks” unexpectedly. I definitely recommend practicing with a batch first to see how you feel about it! Hi! I followed, felt, experienced every single word you mentioned above. And I was super happy to successfully whipped my very own swiss meringue buttercream. Thank you thank you so much. Hee. Hi, I have tried this recipe 3 times and it doesn’t get thick. When I put the butter is gets soft buy it never gets ok. Believe me, I do it exactly as you say in the blog. I’m using salted butter, does it matter? The other possible cause is the extremely hot hot hot and humid whether in my city, does it mater? Should I try to mix it in my bedroom with air conditioning? Unfortunately, the hot weather is likely to blame. The butter might be melting. 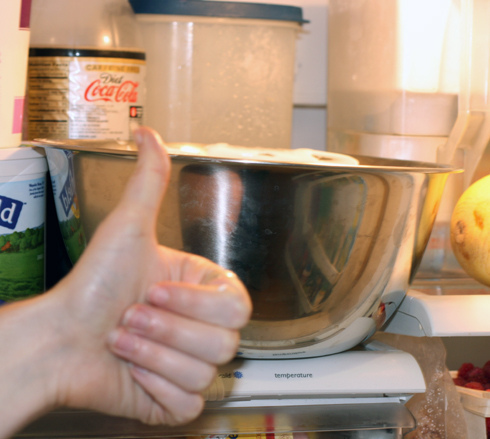 Trying it in an air-conditioned room might help, but you will have to keep the cake in that room or the fridge after it’s frosted so that the frosting doesn’t melt.